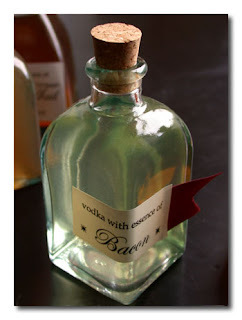 Reading up on some of my favs, I stumbled across this on Brownie Points, Bacon Vodka. While not an avid bacon lover, I do see the appeal. My favorite quote on it "Well I would have to say reminds me of drinking vodka martinis all night long and then ending up at some greasy spoon and ordering the bacon with your breakfast." Not the worst review. And easy enough for me to want to try at home. I think what I like the best is the idea of small kits of vodka tasters... now that's a birthday gift you can really enjoy! My roommate actually worked up a batch of this a while back. I have to say, I find it preferable to ordinary, non-bacon vodka (vegetarian vodka? ), though possibly that would not hold up in larger quantities. It's a tough call. It is kind of fundamentally gross, but it's also kind of fundamentally awesome. عزيزي العميل شركة مكافحة الفئران بابها هي من أفضل وأحسن وأهم الشركات التي تعمل علي القضاء علي الحشرات، واستطاعت شركتنا أن تقدم أفضل الخدمات وهي حققت الكثير من النتائج الباهرة وهذا ما جعل شركة مكافحة الفئران بابها هي الأولى والمتصدرة عن الشركات الأخرى، ولذلك عزيزي العميل إذا كنت تعاني كثيرا من الفئران الشائعة في المنزل فعليك بالاستعانة بشركة مكافحة الفئران بابها فهي الأمثل والأفضل.